If you're at all into theater, cinematography or even media studies in general, you've probably run into the term 'the fourth wall' before. In case you haven't, it refers to the illusion that we experience while watching a movie or a play, where we can see at most only 3 walls on the stage, and the fourth wall is represented by our gaze, whether it's at a screen or at the edge of a stage. "Breaking the fourth wall' is what happens when an actor from the production breaks the illusion that the viewer is only passive, and not actually an integral part of the performance. There are a number of examples of how this is used to great effect; the critically-acclaimed Netflix series House of Cards uses it between the main character and the viewer, as does the even more recent USA Network show Mr. Robot, between the narrator and the viewer. Typically, however, this is an obvious and intentional decision made by the writers and producers of the show as a narrative device, but this isn't always the case. 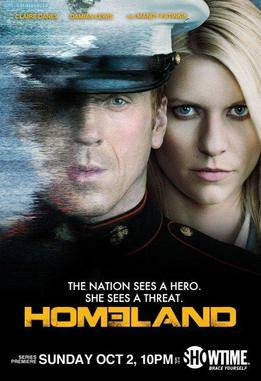 The show Homeland concerns the trials and tribulations of a CIA agent and her various struggles with Iranian and other Middle Eastern intelligence assets, but it's not shot on location anywhere in the Middle East. As a result, when recreating some of the scenes they need as studio sets, they decided to hire a group of graffiti artists to replicate some of the defiant urban feel - but all in Arabic script. Unfortunately for the set designers, none of them were fluent in Arabic, and the artists decided to use the chance as a moment to speak out about the way the show depicts the Arab world, crashing right through the fourth wall without looking back. A number of subversive graffiti tags were chosen and used on set, and the artists were lucky enough to get their tags shown on screen. "Homeland is racist" is a fairly obvious one, but another one read "Homeland is a watermelon", which is apparently a common Arabic idiom to describe something as silly or meaningless.